This is the question Isabel Sawhill of the Brookings Institution asks in a tightly written discussion of the factors relating inequality with opportunity. The most important qualification is that while inequality in parental incomes determines the opportunities and prospects of children, at the same time it is also a signal of other behaviours that are equally important: education, motivation, and a strong family. Children who are advantaged at birth—by not only living in a family with income above the poverty line, but also having married parents, a mother with at least high school, and being born at a normal birth weight—are more likely to succeed in the early years, but also in adolescence and ultimately adulthood. It is not just poverty of money that matters, but also poverty of experience and expectation. Or in other words, taxes and transfers cannot simply move a society up and down “The Great Gatsby Curve,” the term Alan Krueger, the Chairman of the Council of Economic Advisors, used to describe the relationship between more inequality at a point in time and less opportunity over time. Sawhill pays some attention to the effectiveness of public policy in promoting the types of behaviours important for promoting the upward mobility of those who are relatively disadvantaged. And while she also stresses the need for active interventions on the behalf of government, her policy brief is silent on the relationship between labour market inequality and the politics of public policy. In a more unequal society is it also less likely that public policy can be designed to be of relatively more advantage to the relatively disadvantage? That inequality in incomes may imply more inequality in political voice is a concern expressed and documented by Jacob Hacker and Paul Pierson in their book Winner Take all Politics, and more recently by Daron Acemoglu and James Robinson in Why Nations Fail. If this is the case, then it is important to be concerned not only with the barriers to upward mobility faced by the less advantaged, but also that the rules of the game are not skewed by a political process that is less in tune to their needs. Inequality shapes opportunities because it also has the potential to shape public policy. We can’t AFFORD a “Permanently Divided Society”. Finally the mainstream media is “getting it”. As I type this, the article referred to is only a few hours old but has already attracted 655 comments – including some from me personally. I’ve seen some busy message boards before – but out of all of them, this one really “takes the cake”. Should it surprise us? I don’t think so. I have been arguing for some time now that above all we need a strong theory of social justice. Before we tackle inequality in all its forms, before we legislate, before we interpret (or, I’d argue, even do) research, and before we vote we need a theory of social justice. What is the right amount of “advantageness”? Why should we not allow people and firms in power to use their capital to obtain more power? How much political power should we allow them to obtain? Where do we draw the line? 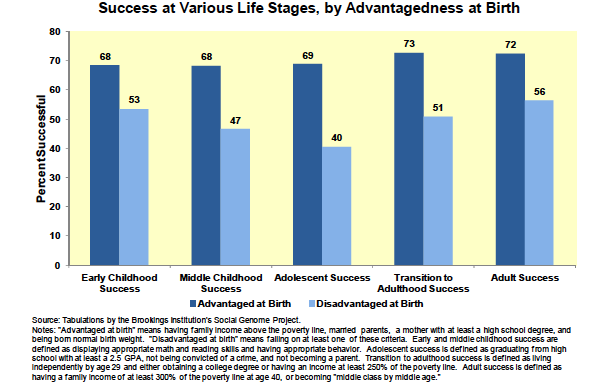 How much upward mobility is enough? How much social division can we tolerate before we transgress some moral limit? If we are in fact hurling towards a permanently divided society, how much effort should we expend in halting this development? I understand the instantly intuitive response to these questions: it’s not too hard to defend equality and mobility from the heart. But why? By what objective law must we pursue these things? And how much should we pursue them? Toward what measurable level of mobility should we strive? You see, my issue is that I don’t know how far we are supposed to go. Amartya Sen has alleviated my concerns partly and his works have been important to me, especially The Idea of Justice. But even The Idea of Justice didn’t quite do it for me. Because it didn’t tell me WHICH injustice we ought to alleviate first. How do we allocate our resources towards the alleviation of different injustices? At what point do we stop allocating resources towards the alleviation of one injustice and shift to the alleviation of another? If we fight to increase mobility, how much should we spend doing that? And when do we redirect resources away from that and towards the combat against other social problems? It may seem like I am deviating from the point of Mr. Corak’s blog entry, but I don’t think I am. The issue I present is that “okay, we clearly have some kind of development here”. And I say “okay, and so what now”? This really stresses me out because I see these issues and my immediate response is “this is disconcerting, we must act” and then my mind says “okay, to what end? how? how much? why?”. And this informs the way I see and interpret the research. Mr Corak- this post of mine is similar to another I made on your previous entry. I hope it doesn’t appear that I am just babbling irrelevantly. I understand the huge importance of doing this research and showing the facts; I admire the people who do this research and hope to be one of them in the near future. I guess the point I mostly want to make though is that the facts derive at least some of their value from the consequences and actions they inspire and the theory of social justice in whose context they appear. The way we interpret the significance of research findings also depends on this. And so I wonder what the consequences are and should be. Sorry for getting all lengthy and wordy. You might add a paper by Sawhill with the same title is forthcoming in Economics of Inequality, Poverty and Discrimination in the 21st Century, edited by Robert S. Rycroft. Santa Barbara, CA: ABC-Clio Publishers. If you send me a pdf of the Table of Contents for this volume I would be happy to post it. Voilà! And there you have it! Q.E.D.!! NOBODY was looking at the question of availability of satisfactory employment for all those people who were persuaded to take out home loans and then couldn’t pay when the time came to pay! Everybody was “looking the other way”, that’s absolutely clear from this. How BRAINLESS can one get!! The same thing is evident from Richard Bitner’s book “Confessions of a Subprime Lender” – not so much as ONE explicit mention of any job problem / shortage of jobs relative to numbers looking for them. It is IMPOSSIBLE to manage an economy properly – including the Canadian one – without paying proper attention to the numbers of jobs needed to employ everybody properly.